In 1928 Cecil Kimber introduced an affordable sports car known as the M type Midget. It was simple, inexpensive yet proved highly successful in motor sport with its 8 horsepower 847cc Wolseley based engine. The Midget had comparable performance to the larger 14/40 and 18/ 80 models and at less than half the price of a 14/ 40 soon accounted for more than 50% of the total sales in the year following its introduction. The MG Car Company then had to move its operation to larger premises in Abingdon to accommodate the demand for their cars. This was effected in 1930 and the site that was chosen was next to the disused Pavlova Leather Factory, this was eventually to become the world's largest sports car factory, with its distinctive brown and cream painted walls and many octagonal fitments. It was also at this time that the phrase 'Safety Fast' was adopted as a sales slogan. With the huge success of the M Type Midget and the big price differential between it and the 18/80 range, it was fairly obvious that another model was needed to fill the gap after the ceasing of the old side valve Morris based cars. The Wolseley Hornet was introduced in 1930 with a 12 horsepower engine and was simply a stretched Morris Minor. Kimber was not overly impressed with this car and although he must have considered a 12 horsepower Midget, he was not tempted to put any ideas into production based on the Morris, besides the Abingdon design team were busy with plans for the Double Twelve version of the M type which was a far more important car that led the way for the C type Montlhery Midget. 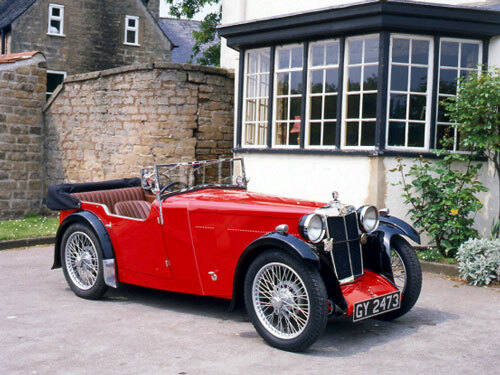 It was not until September 1931 that MG introduced its own 12 horsepower car designated the F type Magna. This was a six cylinder version of the D type which was launched at the same time and was a direct follow on from the C type. The two new chassis, had sliding trunnion suspension and centre-lock wire wheels and both cars were offered with either a closed saloon type body or as an open 4 seater. The F type had a wheelbase of 7'10" whilst the D type had 7'0" wheelbase and shared the same axles, steering gear and brakes. Like the D type the F type had a rivetted steel chassis frame with an underslung rear axle, the extra length of the F type frame was to accommodate the six cylinder engine and the two rear seats. The engine was not a new design although Abingdon tried to pretend it was. The power unit was essentially a Wolseley Hornet engine with two extra cylinders tacked on' and a lot of camouflaging sheet metal work around the block to disguise its origin. The capacity was 1271cc with a power output of 37bhp and both the camshaft and crankshaft ran in four main bearings, with the front bearing a ball race as with the Midget. The intermediate bearings consisted of aluminium housings with white metalled bronze bushes, similar to those on the original Morris Oxford engines. The aluminium housings were clamped to the crankshaft and the whole unit was then fed through the front of the crank-case with the intermediate bearings clamped by long through bolts. The big ends consisted of white metal applied directly to the rods although some early engines utilised aluminium rods that required white metalled bronze-bushes. The Camshaft was vertically driven and distinctly of M type parentage and the valve gear and porting was virtually the same as the M type as well. The drive was through a dry plate clutch and thence through a racing type EN V gearbox similar to that fitted on the C types with straight cut gears. The F types generally lacked performance at the top end but there is no doubt that it was a genuine sports car and it looked the part. The car did sell well alongside the popular M type, the D type did not fair so well with only 250 being produced. The F type it was admitted was slightlv underpowered for its size and weight and this was certainly emphasised when 4 adults were on board. The engine was undeniably smooth with plenty of torque from very low down in the rev range right the way through to maximum revs and a gearbox with ideal ratios gave the right combination for pleasurable driving. At the time of the 1932 Motor Show the specification of the F type was changed slightly with the addition of 12" brake drums and the fitting of extra water manifolding to aid cooling. These were seen as major improvements and a two seater version employing a J2 body was designated the F2 Magna and the new 4 seater version became known as the F3. It is worth noting though that having these additions does not automatically make the car an F2 or F3 as earlier F1s were fitted with these options by the factory as and when they became available. The F type certainly looked good in any of its various body styles which is one of the reasons why it enjoyed good sales, with the two and four seater option together with the salonette versions there were also variations built by some English coachbuilders such as Jarvis, Styles, Abbey, Carlton, University Motors, Windover, Vanden Plas, Farnham, Wye and Meredith. Bore and Stroke: 57mm x 83mm. Valve operation: Single overhead camshaft driven through vertical dynamo. Power output: 37.2 bhp @ 4,100 rpm. Gearbox: Manual 4 speed non synchromesh. Brakes: Mechancially operated by Bowden cable. 8" diameter drums all round. Track: 3'6" front and rear. Weight: 19 cwts 1 qr. Body types: 4 seat open and 4 seat salonette. Fuel consumption: Approx 26 mpg.